Most missions are focusing on cities in our modern times. The thought is that a majority of the people live in the city so that is where the largest group of the lost are located. 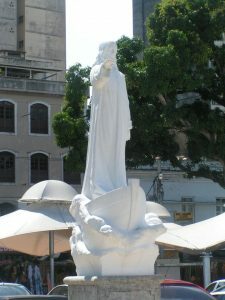 This strategy has resulted in the city of Belém filled with all sorts of churches and religious enterprises while the river and the surrounding country side for the most part is void of churches. 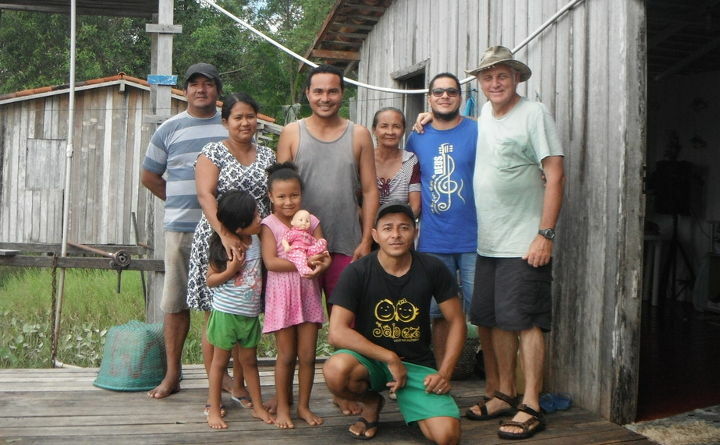 In our ministry we seek to plant churches in areas where there is a shortage of churches which is why we are living out on the river seeking to plant churches among the islands of the Amazon River. The next question to ask is why do not the city churches plant new churches out on the river. There are a lot of reasons why this has not happen. One is the culture difference, the river people are very different from city folks. The life style is simple and to many in the city it is a life of poverty. Then there is the prejudice against the river people, they are just not seen as real people. One good example of this is opening a bank account. If you do not have mail service to your house or an electric bill, then you can not open a bank account. You do not exist. Pray for out efforts out here on the river. At the heat of our ministry is the training of leaders in practical ministry. Our goal is to plant churches using volunteers who have no ministry experience or credentials. It is these men who volunteer their time and learn how to build the church from the foundation laying process that are the future church leaders and planters. Our system is not complex but based on learning the stories of the Bible, KISS (Keep is simple stupid). Jesus taught like this, he send out the 72 to tell His story and they made a big impact as God used them to change the world. The same is true here, leaning and telling stories is not complicated but with these stories and practical ministry experience these men can open a new community for Christ. 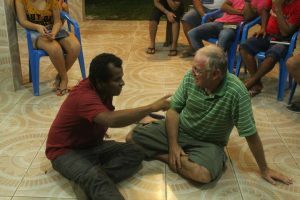 Pray for out leaders as they learn how to minister to the people living on the island in the Amazon River. When you think of a man who is fishing for a living you have in mind this big mussel bound guy. Not so here on the Amazon. 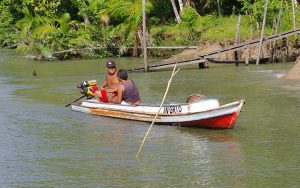 Most fisherman I know are skinny and spend most of their day out in a small canoe trying to catch fish to sell in the market. They will either sell it to a vendor they know well or just sell the fish off their boat. There are stories of how the fish used to be monsters but now catches are small, mostly because of over fishing by lager boats or corporation who can just scrape up the fish in big nets. The local guy just gets what is left over, unless they have access to a special spot where the big boat can not go. I take it you have been the the exotic pet store and seen one of there birds for sale. Many of these birds are bread in captivity and not from the wild. 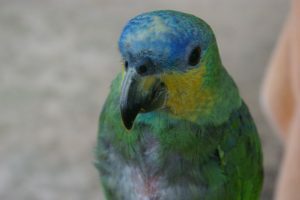 He my friends just pluck them out of the tree, trim their wings and the have a parrot for a pet. 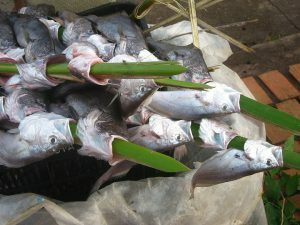 They are a popular pet to have at your house and easy to feed. 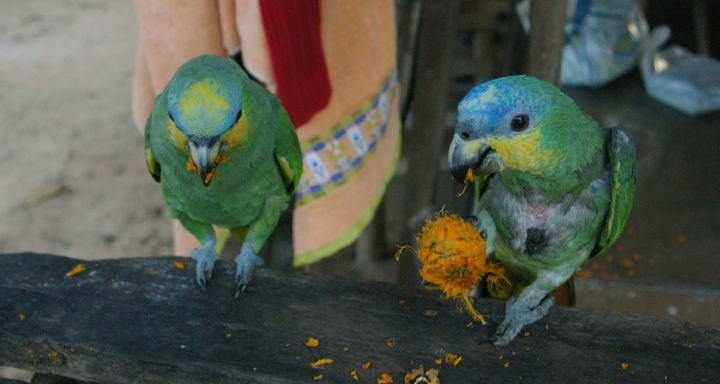 These birds eat fruit from the trees. When a mango tree is full of fruit there will be flocks of these birds in the trees eating mangoes and tossing the remains on the people below. Our friends just go out in their yard or just walk in the street and pick fruit from the trees for their birds. If they have a big fruit tree they just let the parrot lose and he will climb up the tree to eat the fruit. Yes cats eat parrots. These boats are made out of Brazilian hard wood. They are very heavy and to pick up and move. It will take ten men to move one of these small boats. They are very durable and can stay out on the river day and night without a problem. What happens when you fill them with water. Well they float just below the level of the water. How do I know that, from experience! The last boat we had like this we did sink the boat near the beach. The waves poured in and filled the boat to the top with water. It did not stay on the beach but floated off the beach. Now my aluminum boat will not float! It sinks to the bottom of the beach and it took a good crew to bail the water out and float her. Pray for out safety. Last Sunday many months of work has bore fruit. Christava has finally taken that step of faith and got baptized. It was exciting. This time we did not use the beach location but I drove seven of us from the island of Cotijuba to the Monkey Island Church. Pastor Jeu is my teammate and pastor of this church. There is no beach but a platform off the dock surrounded my mud. On the ramp stood several church members who sang for him as he took this step of faith. 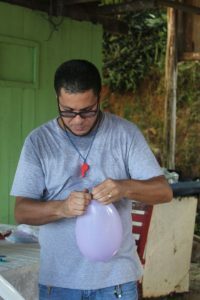 He now is brimming with joy at what the Lord is doing in his life. Now we need him transformed into a leader of our small group of believers. Pray that the Holy Spirit continues to work in his life. 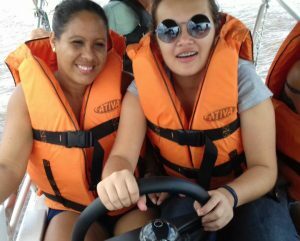 Some of the city volunteers that join us on this great endeavor, this is their first time to be out in a small boat. They discover the Amazon is not for the faint hearted. They are wearing the life jackets for a reason. The water can be very calm, but this is a river with a lot of large boat traffic. These monster ships, from out perspective, can create a large wake. It can be as high as three feet but two feet is bad enough. I have to stop the boat and wait for the wave to come to me. I then pass the bow of the boat through the wave. It is normally only two or three big waves, then it passes and we continue on our way. Some days the first wave will come into the boat. That is why I have a pump to keep the boat dry. Pray for our endeavor. This long beach looks like an inviting place till the helicopter shows up. This means that there has been a death or someone is missing. The beach where we live is a very long beach at low tide. If you are brave enough you can walk out a quarter mile on the sand and mud if you take the proper path. We have fisherman who have laid traps out in these parts of the beach but they know what they are doing. These tourist that visit for the day or the weekend have no idea of the dangers. The city will provide life guards on popular holidays to try and keep the tourist safe. It is very popular for the tourist to spend the day drinking on the beach sitting under a large umbrella for the shade. It looks like a holiday paradise till a drunk individual wades way out on to the beach. It is here the harsh reality that this is a river beach with tides that change 12 foot in just three hours. The tide can come in very quick and since it is a river the current is pulling out from the beach. This is when people are sweep away by the water. 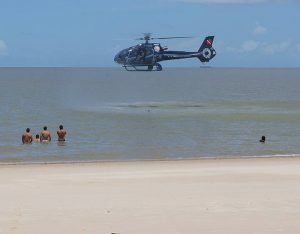 This is when the helicopter is called in because the life guards are not going to risk their life in these dangerous waters. The helicopter will fly low to the water all around the island two or three times looking for the body. If it does not find it in three passes they seem to give up and head back to their base. Our ministry is centered around Bible Storying as a key strategy to share the Gospel Message with people living out on the river. 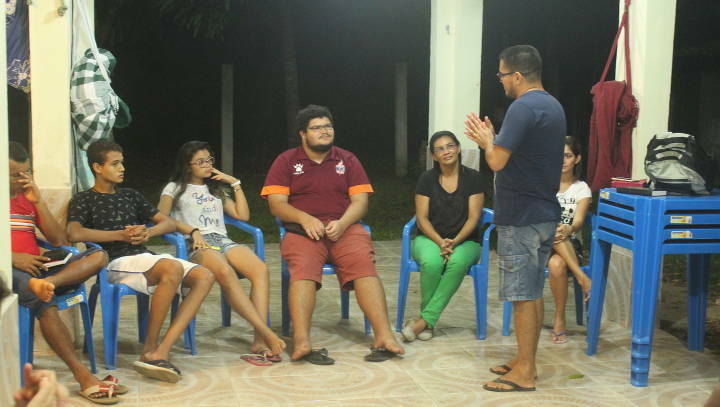 This is not something you will find taught at the local bible schools near Belém. It has been such an effective way to reach people here, yet there are only a few of us actually telling the stories. This is why we started Bible Storying Training for members of our city churches. As we seek to partner with them, they need to be equipped to tell the stories on our evangelism out reaches. We have tried a variety of formats but have settled on the one shot weekend format. We will set up a Bible Storying Training Event, they love events, and invite about 30 people to join us for the weekend normally Friday through Sunday. It is a crash course in story telling where we try to get them to memorize and tell about 20 short stories from the Bible. Many who attend know the Bible well but have never told scripture as a story. It has been a success for our ministry. So continue to pray for our story tellers. Living on the island we see lots of ships pass by all day long. 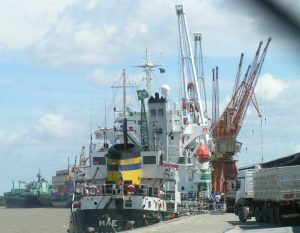 Some of them are heading to the port of Belém, which is the city where we live. The doc area is not very large, it will only handle a few ships at a time. 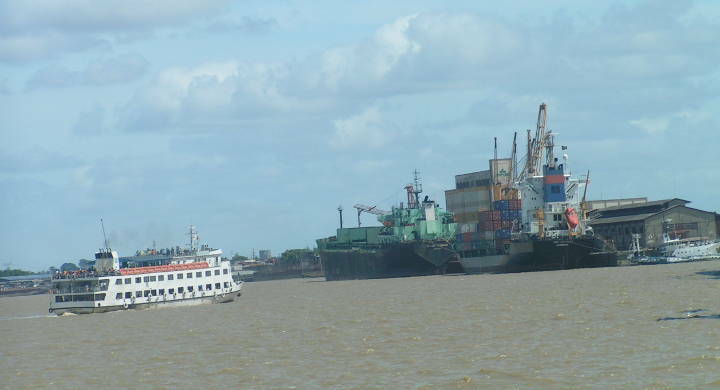 That is why it is common to see ships parked in the river and smaller boats unloading them. Being a port city we sometimes get a visit from a curse ship. Not the super large ones but small vessels with the tourist who look like us. So we there is a cruse ship in town the locals think we are tourist and try and strike up a conversation in English. One time we arrived by boat into town and the curse ship’s professional photographer took our picture thinking we were one of his guest. What fun! Being a foreigner living in a port city has some interesting twist. We would like to connect with you through our monthly newsletter. It is easy and straightforward. Sign Up Now!